The Islamic Emirate of Afghanistan (Pashto: د افغانستان اسلامي امارات‎, Da Afghanistan Islami Amarat) was a totalitarian Islamic state established in September 1996 when the Taliban began their rule of Afghanistan after the fall of Kabul. 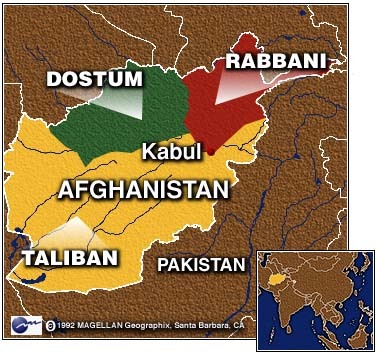 At its peak, the Taliban established control over approximately 90% of the country, whereas remaining parts of the country in the northeast were held by the Northern Alliance, who maintained broad international recognition as a continuation of the Islamic State of Afghanistan. After 9/11, international opposition to the regime drastically increased, with diplomatic recognition from the United Arab Emirates and Pakistan being rescinded. The Islamic Emirate ceased to exist on December 17, 2001, after being overthrown by the Northern Alliance, which had been bolstered by a US-led invasion of the country. The Taliban and its rule arose from the chaos after the Soviet–Afghan War. It began as an Islamic and Pashtun politico-religious movement composed of madrasa students in southern Afghanistan. Overwhelmingly ethnic Pashtuns, the Taliban blended Pashtunwali tribal code with elements of Sunni Islamic teaching to form an anti-Western and anti-modern Islamic ideology with which it ruled. It began to receive support from neighboring Pakistan as well as from Saudi Arabia and the United Arab Emirates (UAE). The Taliban considered many of Afghanistan's other ethnic communities as foreign. Pashtun people are the largest ethnic group in Afghanistan and compromised the vast majority of the Taliban movement. As the Taliban expanded from their southern and south-eastern strongholds, they encountered more resistance; their brand of Deobandi Islam, incorporated with the Pashtun tribal code of Pashtunwali, was viewed as foreign by the other ethnic groups of Afghanistan. The Battles of Mazar-i-Sharif illustrated this ethnic tension. Spreading from Kandahar, the Taliban eventually ruled Kabul in 1996. 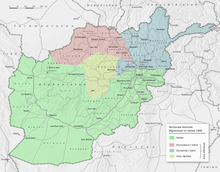 By the end of 2000, the Taliban were able to rule 90% of the country, aside from the opposition (Northern Alliance) strongholds primarily found in the northeast corner of Badakhshan Province. Areas under the Taliban's direct control were mainly Afghanistan's major cities and highways. Tribal khans and warlords had de facto direct control over various small towns, villages, and rural areas. The Taliban sought to impose a strict interpretation of Islamic Sharia law upon the entire country of Afghanistan. During the five-year history of the Islamic Emirate, women were banned from working, and girls were forbidden to attend schools or universities and were requested to observe purdah and to abstain from obscenities. Those who resisted were punished. Communists were systematically executed and thieves were punished by amputating one of their hands or feet. Meanwhile, the Taliban succeeded in nearly eradicating the majority of the opium production by 2001. Cabinet ministers and deputies were mullahs with a "madrasah education." Several of them, such as the Minister of Health and Governor of the State bank, were primarily military commanders who were ready to leave their administrative posts to fight when needed. Military reverses that trapped them behind lines or led to their deaths increased the chaos in the national administration. At the national level, "all senior Tajik, Uzbek and Hazara bureaucrats" were replaced "with Pashtuns, whether qualified or not." Consequently, the ministries "by and large ceased to function." The Sharia does not allow politics or political parties. That is why we give no salaries to officials or soldiers, just food, clothes, shoes, and weapons. We want to live a life like the Prophet lived 1400 years ago, and jihad is our right. We want to recreate the time of the Prophet, and we are only carrying out what the Afghan people have wanted for the past 14 years. They modeled their decision-making process on the Pashtun tribal council (jirga), together with what they believed to be the early Islamic model. Discussion was followed by a building of a consensus by the "believers". Before capturing Kabul, there was talk of stepping aside once a government of "good Muslims" took power, and law and order were restored. Decisions are based on the advice of the Amir-ul Momineen. For us consultation is not necessary. We believe that this is in line with the Sharia. We abide by the Amir's view even if he alone takes this view. There will not be a head of state. Instead there will be an Amir al-Mu'minin. Mullah Omar will be the highest authority, and the government will not be able to implement any decision to which he does not agree. General elections are incompatible with Sharia and therefore we reject them. The Taliban were very reluctant to share power, and since their ranks were overwhelmingly Pashtun they ruled as overlords over the 60% of Afghans from other ethnic groups. In local government, such as Kabul city council or Herat, Taliban loyalists, not locals, dominated, even when the Pashto-speaking Taliban could not communicate with the roughly half of the population who spoke Dari or other non-Pashtun tongues. Critics complained that this "lack of local representation in urban administration made the Taliban appear as an occupying force." Only Pakistan, Saudi Arabia, and the United Arab Emirates (UAE) recognized the Taliban government. The state was not recognised by the UN, which instead recognized the Islamic State of Afghanistan as being the legitimate government of Afghanistan. In 2013, the Taliban opened an office in Qatar with the goal of beginning talks between themselves, the United States and the Islamic Republic of Afghanistan. There was a conflict after the office raised the white flag of the former Islamic Emirate of Afghanistan, with U.S. Secretary of State John Kerry saying that the office could be closed if there was not a "move forward" in peace negotiations. I did not want to destroy the Bamiyan Buddha. In fact, some foreigners came to me and said they would like to conduct the repair work of the Bamiyan Buddha that had been slightly damaged due to rains. This shocked me. I thought, these callous people have no regard for thousands of living human beings – the Afghans who are dying of hunger, but they are so concerned about non-living objects like the Buddha. This was extremely deplorable. That is why I ordered its destruction. Had they come for humanitarian work, I would have never ordered the Buddha's destruction. Then Taliban ambassador-at-large Sayed Rahmatullah Hashemi also said that the destruction of the statues was carried out by the Head Council of Scholars after a Swedish monuments expert proposed to restore the statues' heads. Hashimi is reported as saying: "When the Afghan head council asked them to provide the money to feed the children instead of fixing the statues, they refused and said, 'No, the money is just for the statues, not for the children'. Herein, they made the decision to destroy the statues"
This prompted an international outcry from nations such as Japan, India, Sri Lanka, South Korea, Nepal, Iran, Qatar, and Russia. Even Saudi Arabia and the UAE, both of which were among only three nations to recognize the Islamic Emirate of Afghanistan, voiced their opposition. The Arab branch of UNESCO, a cultural and educational agency of the United Nations, labelled the destruction as "savage". On 15 October 1999, the UN Security Council established a sanctions regime to cover individuals and entities associated with Al-Qaeda, Osama bin Laden and/or the Taliban. Since the U.S. Invasion of Afghanistan in 2001, the sanctions were applied to individuals and organizations in all parts of the world; also targeting former members of the Taliban government. The Taliban maintained a military during their period of control. The Taliban army possessed over 400 T-54/55 and T-62 tanks and more than 200 armoured personnel carriers. The Afghan Air Force under the Taliban maintained five supersonic MIG-21MFs and 10 Sukhoi-22 fighter-bombers. In 1995, during the 1995 Airstan incident, a Taliban fighter plane captured a Russian transport. They also held six Mil Mi-8 helicopters, five Mi-35s, five L-39Cs, six An-12s, 25 An-26s, a dozen An-24/32s, an IL-18, and a Yakovlev. Their civil air service contained two Boeing 727A/Bs, a Tu-154, five An-24s, and a DHC-6. According to the testimony of Guantanamo captives before their Combatant Status Review Tribunals, the Taliban, in addition to conscripting men to serve as soldiers, also conscripted men to staff its civil service. The Kabul money markets responded positively during the first weeks of the Taliban occupation. But the Afghani soon fell in value. They imposed a 50% tax on any company operating in the country, and those who failed to pay were attacked. They also imposed a 6% import tax on anything brought into the country, and by 1998 had control of the major airports and border crossings which allowed them to establish a monopoly on all trade. By 2001 the per capita income of the 25 million population was under $200, and the country was close to total economic collapse. As of 2007 the economy had begun to recover, with estimated foreign reserves of three billion dollars and a 13% increase in economic growth. Under the Transit treaty between Afghanistan and Pakistan a massive network for smuggling developed. It had an estimated turnover of 2.5 billion dollars with the Taliban receiving between $100 and $130 million per year. These operations along with the trade from the Golden Crescent financed the war in Afghanistan and also had the side effect of destroying start up industries in Pakistan. Ahmed Rashid also explained that the Afghan Transit Trade agreed on by Pakistan was "the largest official source of revenue for the Taliban." Between 1996 and 1999 Mullah Omar reversed his opinions on the drug trade, apparently as it only harmed kafirs. The Taliban controlled 96% of Afghanistan's poppy fields and made opium its largest source of taxation. Taxes on opium exports became one of the mainstays of Taliban income and their war economy. According to Rashid, "drug money funded the weapons, ammunition and fuel for the war." In The New York Times, the Finance Minister of the United Front, Wahidullah Sabawoon, declared the Taliban had no annual budget but that they "appeared to spend US$300 million a year, nearly all of it on war." He added that the Taliban had come to increasingly rely on three sources of money: "poppy, the Pakistanis and bin Laden." In an economic sense it seems however he had little choice, as due to the war of attrition continued with the Northern Alliance the income from continued opium production was all that prevented the country from starvation. By 2000 Afghanistan accounted for an estimated 75% of the world's supply and in 2000 grew an estimated 3276 tonnes of opium from poppy cultivation on 82,171 hectares. At this juncture Omar passed a decree banning the cultivation of opium, and production dropped to an estimated 74 metric tonnes from poppy cultivation on 1,685 hectares. Many observers say the ban – which came in a bid for international recognition at the United Nations – was only issued in order to raise opium prices and increase profit from the sale of large existing stockpiles. The year 1999 had yielded a record crop and had been followed by a lower but still large 2000 harvest. The trafficking of accumulated stocks by the Taliban continued in 2000 and 2001. In 2002, the UN mentioned the "existence of significant stocks of opiates accumulated during previous years of bumper harvests." In September 2001 – before 11 September attacks against the United States – the Taliban allegedly authorized Afghan peasants to sow opium again. There was also an environmental toll to the country, heavy deforestation from the illegal trade in timber with hundreds of acres of pine and cedar forests in Kunar Province and Paktya being cleared. Throughout the country millions of acres were denuded to supply timber to the Pakistani markets, with no attempt made at reforestation, which has led to significant environmental damage. By 2001, when the Afghan Interim Administration took power the country's infrastructure was in ruins, Telecommunications had failed, the road network was destroyed and Ministry of Finance buildings were in such a state of disrepair some were on the verge of collapse. On 6 July 1999 president Bill Clinton signed into effect executive order 13129. This order implemented a complete ban on any trade between America and the Taliban regime and on 10 August they froze £5,000,000 in Ariana assets. On 19 December 2000 UN resolution 1333 was passed. It called for all assets to be frozen and for all states to close any offices belonging to the Taliban. This included the offices of Ariana Afghan Airlines. In 1999 the UN had passed resolution 1267 which had banned all international flights by Ariana apart from pre approved humanitarian missions. ^ "FACTBOX: Five Facts on Taliban Leader Mullah Mohammad Omar". 17 November 2008. Retrieved 29 September 2014. ^ "Role of the Taliban's religious police". 27 April 2013. Archived from the original on 9 August 2014. Retrieved 29 September 2014. ^ Carlotta Gall (30 July 2015). "Mullah Muhammad Omar, Enigmatic Leader of Afghan Taliban, Is Dead". The New York Times. Retrieved 15 February 2016. ^ "Profile: Mullah Mohammed Omar". BBC. 29 July 2015. Retrieved 15 February 2016. ^ "Mullah Mohammed Omar". The Independent. 31 July 2015. Retrieved 13 February 2016. ^ "Where Will the New Taliban Leader Lead His People?". Moscow Carnegie Center. 11 August 2015. Retrieved 13 February 2016. ^ "Mullah Omar: Life chapter of Taliban's supreme leader comes to end". CNN. 29 July 2015. Retrieved 13 February 2016. ^ Marcin, Gary (1998). "The Taliban". King's College. Retrieved 26 September 2011. ^ "Map of areas controlled in Afghanistan '96". ^ "Why are Customary Pashtun Laws and Ethics Causes for Concern?". Archived from the original on 21 October 2014. Retrieved 15 February 2015. ^ Administrator. "CF2R". Archived from the original on 10 August 2014. Retrieved 15 February 2015. ^ http://www.theage.com.au/news/world/wandering-kuchis-pay-for-their-taliban-links/2005/08/26/1124563029556.html"Most recently, they had the protection of their fellow ethnic Pashtuns, the Taliban, who looted and torched Tajik, Uzbek and Hazara communities"
^ http://lhvnews.com/en/news/2579/role-of-the-taliban%E2%80%99s-religious-police "They described the Hazara, Tajiks, Uzbeks and the Kizilbash (Turkmens) as non-Afghan people and believed that those people had immigrated to the country from Tajikistan,(Turkmenistan), Uzbekistan and Iran." ^ http://www.hazara.net/2013/04/massacre-in-mazar-sharif-2/"During the first day they indiscriminately killed any one they saw, from Tajik Uzbek and Hazara ethnic groups but after that they started killing specifically Hazaras"
^ Genocide, Ethnonationalism, and the United Nations: Exploring the Causes of Mass Killing Since 1945 by Hannibal Travis, pg.115 "The massacres in Mazar-i-Sharif alone in 1998 claimed 8,000–10,000 lives "
^ "Afghanistan, Opium and the Taliban". Retrieved 15 February 2015. ^ Rashid 2000, p. 100. ^ a b Rashid 2000, pp. 101–102. ^ a b Rashid 2000, p. 98. ^ Rashid 2000, p. 95. ^ Interview with Taliban spokesman Mullah Wakil in Arabic magazine Al-Majallah, 1996-10-23. ^ a b Rashid 2000, pp. 39–40. ^ Terrorism and Global Disorder – Adrian Guelke – Google Libros. Books.google.com. Retrieved 15 August 2012. ^ "SECURITY COUNCIL STRONGLY CONDEMNS MURDER OF IRANIAN DIPLOMATS IN AFGHANISTAN - Meetings Coverage and Press Releases". www.un.org. ^ Michael Semple. "The Taliban's Qatar office is a positive step, but not a prologue to peace". the Guardian. Retrieved 15 February 2015. ^ "U.S. Will Negotiate With Taliban, Helping It Return To Power - Investors.com". Investor's Business Daily. Retrieved 15 February 2015. ^ Crilly, Rob (19 June 2013). "Fury from Hamid Karzai plunges US talks with Taliban into disarray" – via www.telegraph.co.uk. ^ "Kerry: Taliban's Qatar Office Could be Closed if no 'Move Forward'". VOA. Retrieved 15 February 2015. ^ Mohammad Shehzad (3 March 2001). "The Rediff Interview/Mullah Omar". The Rediff. Kabul. Retrieved 27 October 2010. ^ Kassaimah, Sahar (12 January 2001). "Afghani Ambassador Speaks At USC". IslamOnline. Archived from the original on 3 April 2008. Retrieved 6 January 2008. ^ "Over World Protests, Taliban Are Destroying Ancient Buddhas". 4 March 2001. Retrieved 23 December 2016. ^ "Bamiyan statues: World reaction". 5 March 2001. Retrieved 23 December 2016. ^ "Bangor Daily News – Google News Archive Search". Retrieved 15 February 2015. ^ "U.N. Reconciles itself to Five Members of Mulla Omar's Cabinet". America At War. 27 January 2010. Archived from the original on 20 May 2013. Retrieved 15 February 2015. ^ "UN lifts sanctions on 5 former Taliban". CBC News. 27 January 2010. Archived from the original on 8 November 2012. Retrieved 29 December 2017. ^ Dixon, Robyn (13 October 2001). "Afghans in Kabul Flee Taliban, Not U.S. Raids". Los Angeles Times. Retrieved 11 December 2012. ^ "Where have all the flowers gone? : evaluation of the Taliban crackdown against opium poppy cultivation in Afghanistan" (PDF). ^ Marsden, Peter (1998). The Taliban: war, religion and the new order in Afghanistan. Zed Books. p. 51. ISBN 978-1-85649-522-6. ^ Lansford, Tom (2011). 9/11 and the Wars in Afghanistan and Iraq: A Chronology and Reference Guide. ABC-CLIO. p. 147. ISBN 978-1-59884-419-1. ^ Pugh, Michael C.; Neil Cooper Jonathan Goodhand (2004). War Economies in a Regional Context: Challenges of Transformation. Lynne Rienner. p. 48. ISBN 978-1-58826-211-0. ^ Pugh, Michael C.; Neil Cooper Jonathan Goodhand (2004). War Economies in a Regional Context: Challenges of Transformation. Lynne Rienner. p. 52. ISBN 978-1-58826-211-0. ^ Castillo, Graciana del (2008). Rebuilding War-Torn States: The Challenge of Post-Conflict Economic Reconstruction. Oxford University Press. p. 167. ISBN 978-0-19-923773-9. ^ Skaine, Rosemarie (2009). Women of Afghanistan in the Post-Taliban Era: How Lives Have Changed and Where They Stand Today. McFarland. p. 57. ISBN 978-0-7864-3792-4. ^ Skaine, Rosemarie (2009). Women of Afghanistan in the Post-Taliban Era: How Lives Have Changed and Where They Stand Today. McFarland. p. 58. ISBN 978-0-7864-3792-4. ^ Nojum, Neamatollah (2002). The Rise of the Taliban in Afghanistan: Mass Mobilization, Civil War and the Future of the Region. St Martin's Press. p. 178. ISBN 978-0-312-29584-4. ^ Nojum, Neamatollah (2002). The Rise of the Taliban in Afghanistan: Mass Mobilization, Civil War and the Future of the Region. St Martin's Press. p. 186. ISBN 978-0-312-29584-4. ^ a b c d e f g h i j Chouvy, Pierre-Arnaud (2010). Opium: uncovering the politics of the poppy. Harvard University Press. pp. 52ff. ^ Shaffer, Brenda (2006). The limits of culture: Islam and foreign policy. MIT Press. p. 283. ISBN 978-0-262-69321-9. ^ Griffin, Michael (2000). Reaping the whirlwind: the Taliban movement in Afghanistan. Pluto Press. p. 147. ISBN 978-0-7453-1274-3. ^ Wehr, Kevin (2011). Green Culture: An A-to-Z Guide. Sage. p. 223. ISBN 978-1-4129-9693-8. ^ Rashid, Ahmed (2002). Taliban: Islam, oil and the new great game in central Asia. I.B.Tauris. p. 187. ISBN 978-1-86064-830-4. ^ Clements, Frank (2003). Conflict in Afghanistan: a historical encyclopedia. ABC-CLIO. p. 148. ISBN 978-1-85109-402-8. ^ Bennett, Adam (2005). Reconstructing Afghanistan (illustrated ed.). International Monetary Fund. p. 29. ISBN 978-1-58906-324-2. ^ Farah, Douglas; Stephen Braun (2008). Merchant of Death: Money, Guns, Planes, and the Man Who Makes War Possible. Wiley. p. 146. ISBN 978-0-470-26196-5. ^ Askari, Hossein (2003). Economic sanctions: examining their philosophy and efficacy. Potomac. p. 56. ISBN 978-1-56720-542-8. ^ Pillar, Paul R. (2003). Terrorism and U.S. foreign policy. Brookings Institution. p. 77. ISBN 978-0-8157-7077-0.